The crux of Dr. Ingham’s talk is that the typical modern approach to agriculture, in particular the application of ammonium nitrate fertilisers, has destroyed the microbiological organisms that usually cycle nutrients through the soil foodweb. With these organisms gone, we are unable to replenish nutrients in “plant available forms” from the soil mineralogy and are hence committed to adding increasing amounts of these artificial fertilisers year on year. One of the major lessons I took away from the talk was that not all soil nutrients are in forms that plants can use. It is not simply enough to have high amounts of carbon, nitrogen, etc. in a soil. We also need microbiological processes to take place that transform these into plant available forms. As plants photosynthesize, they release sugars, proteins and carbohydrates through their roots – “cakes and cookies”, as Dr. Ingham puts it. These exudates attract, and are fodder for, the fungi and bacteria of the first level of the food web. These in turn excrete acids and enzymes which solubilise nutrients from the surrounding soil particles and absorb them into their bodies. 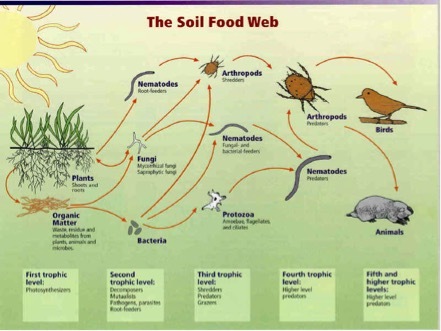 The nematodes & protozoa of the next level in the web then feed on these fungi and bacteria, and it is this digestive action that transforms these nutrients into plant available forms right at the root zone. So, do we all need to become Microbiologists to get the best from our soils? While Dr. Ingham does evangelise that people can and should take a microscopic approach to managing their soil microbiology, she also advocates pragmatism. In broad terms she explains that anaerobic organisms are the “bad guys”, the pests and source of disease. A side effect of anaerobic soil conditions is soil acidification, as Dr Ingham states, “there is no way to have a soil pH lower than 5.5 if aerobic conditions are maintained”. Further to this, in the acidic range, plant available forms of nitrogen, phosphorous and sulphur are lost from the soil in significant amounts through oxidation. Traditional soil test results will only tell you the mineral & nutrient content that is held within the sample in plant available forms. The results tell you nothing of the nutrients locked away in non-available forms within the soil mineralogy. Without the correct microbiology to liberate these minerals, all of this information is for naught. What does this mean for us here in Donegal? Well, as if we didn’t know it already, water management is of the utmost importance. We can’t do anything to change the fact we get 2 metres of average annual rainfall, but with carefully designed landforms & Keyline systems to manage this abundance to prevent the crux of all anaerobic scenarios, waterlogged soil. The power of observation should not be underestimated. Dr Ingham explains: “what would grow in your fields if you did nothing for one year? If the answer is weeds, then your microbiology is bacterially dominated”. At the opposite end of the microbiological balance are the most resilient and self-managing ecosystems on Earth, Woodland habitat, whose microbiology is predominately fungal. Between these two extremes lie pasture and grasslands, where bacteria and fungi exist together as a balanced system. So, the theory goes that with steps to correct water management & by inoculating fungi on a site, we can encourage land back to productive pasture whilst encouraging the microbiology that help support and regenerate the ecosystem. No worries Pat, you should check out the talk on Youtube if you get the chance. Mycellium Running just landed through my door yesterday, so I guess that’s me sorted for winter reading!! !